Since January, I’ve been putting a concerted effort into cooking fresher, healthier meals. But they still have to be full of flavour! Often, I find myself running into the house after dropping off the girls at dance and I have about a half an hour to get dinner on the table before Mac leaves for hockey. 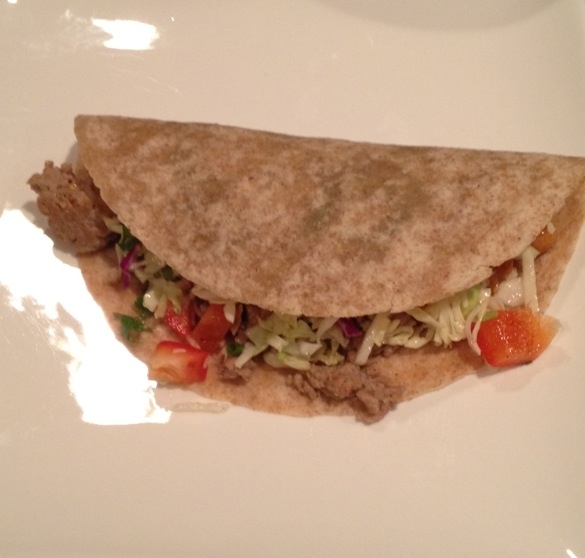 Recently, I came up with my version of Thai tacos. They are fresh, quick and so tasty! Heat up the sesame oil in a wok or frying pan over medium high heat. Add the garlic and the ginger and stir for about 30 seconds. 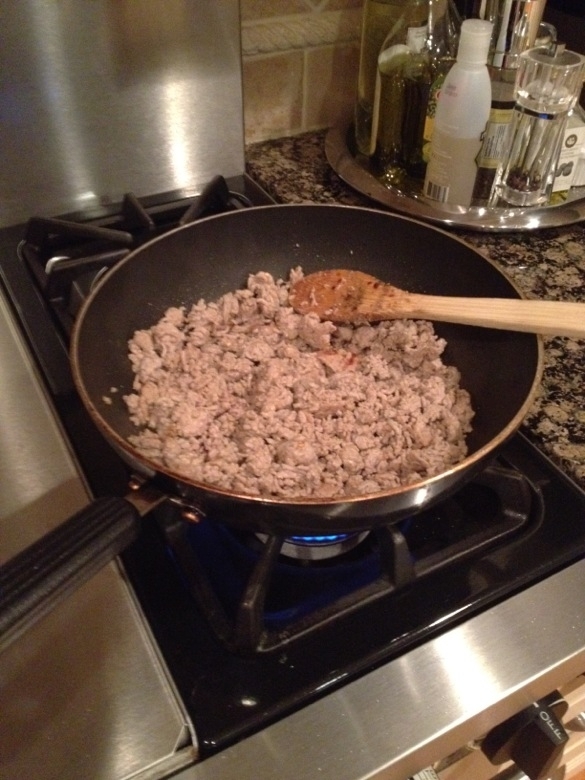 Add the ground chicken and turkey and cook until done, breaking up with a wooden spoon. Add the chiles (just a scant sprinkling if you don’t like it too spicy!) and season with salt and pepper. For the Thai Coleslaw I use this recipe http://allrecipes.com/recipe/quick-and-easy-thai-style-coleslaw/ with a few modifications. I mix all of the dressing ingredients together in a shaker cup. For the dressing, I add salt and pepper and a few crushed chiles. To the package of coleslaw I add about 3 tablespoons of fresh cilantro, 3 tablespoons of chopped green onions, and one diced up red, orange or yellow pepper. 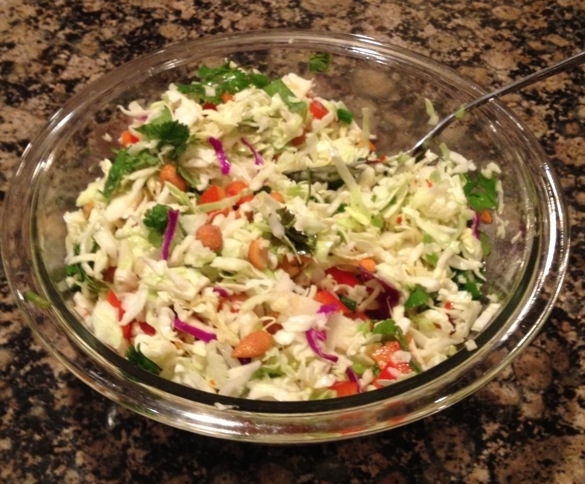 Honey roasted peanuts taste really good in this slaw! 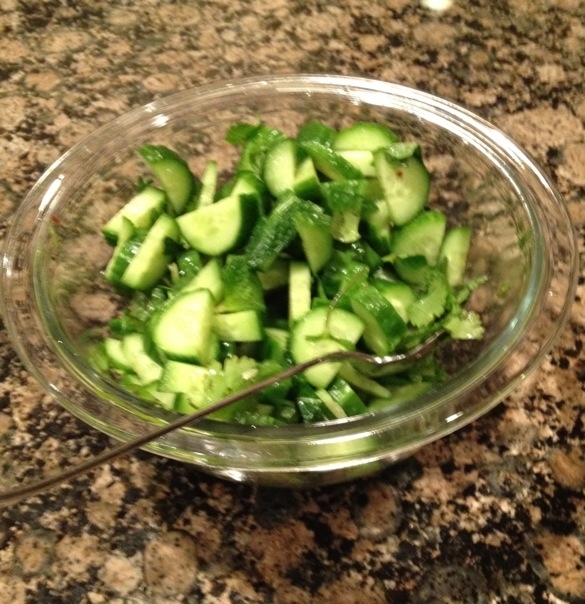 The Cucumber Salad adds another layer of flavour. I modify this recipe too!! Big surprise, hey? I omit the red onion and the peanuts. I love the mint flavour…sooo fresh! 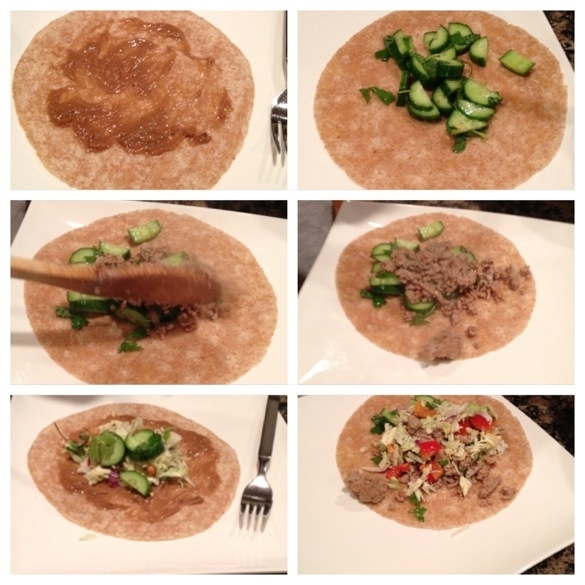 Once everything is made, you are ready to go to town and customize your Thai Taco!!! I like to start with a thin layer of the peanut satay sauce on the tortilla, load up with the coleslaw, add some cucumber salad, and then the ground chicken and top of with a dollop of sweet Thai chili sauce! Soooo good!!!! Here’s how Dylan made her’s….